Depending on your wedding’s style and what your venue allows, Instead of throwing rose petals, your flower girl could toss glitter, bird seed, confetti, or lavender. And you could have some fun and bond with your flower girl by decorating a basket together after a little tea party or sleep-over. Instead of a basket, she could keep whatever it is she’ll be throwing inside containers that help set the scene. Consider a small, hollowed-out (and lined) pumpkin or gourd for an Autumn wedding, or a beautiful bowl, a large teacup or teapot, a seashell, a beautifully decorated box or cute little purse that she can keep after the ceremony. 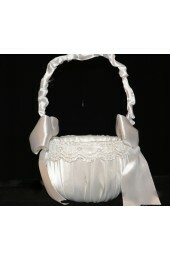 The items you choose can reflect your flower girl’s personality, or yours as a couple. Instead of tossing anything at all, your flower girl could carry something that helps set the tone of your wedding – e.g., a parasol, a fan, a pomander, balloons, a wand, a floral bouquet or an individual flower, pinwheels, sparklers, a candle or lantern, bells, a sign, or even a jar of bubbles she can blow as she walks the path to the altar. Another idea is to have her carry a secret love note that she hands to the groom to read after the nuptials. You can assign your flower girl totally different tasks than just adorning your path. For example, if your wedding gown has a long train, she can help the maid of honor carry it, or if you’re including a pet in your wedding, she can be the person to walk your furry friend down the aisle. Instead of tossing petals, you might have her hand out single flowers to any women that sit along the bridal path – or lollipops to everyone she can easily reach. If you have more than one flower girl, you can have them hold hands as they walk down the aisle (this might help them feel more comfortable if they’re nervous), or carry a large, beautiful garland between them. If one is younger than the other, the older one can pull the younger in a wagon, making for an adorable entrance. You could do things really differently and have an older woman, or women – aunts, grandmothers, etc. – take on the flower girl’s tasks. However you choose to handle the flower girl tradition, we’d love to help you along the way! Please visit our Crystal Bridal Boutique, serving Brooklyn and Gravesend, at 110 Avenue U in Brooklyn. You can contact us by phone at 347-462-4941. We look forward to hearing from you!